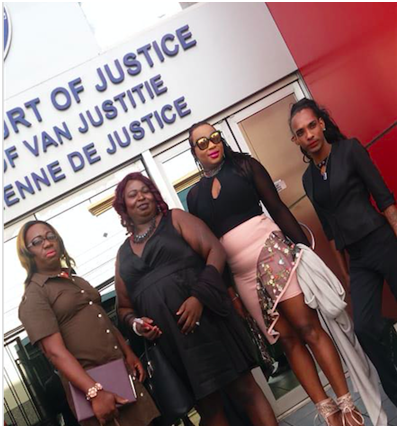 In February 2009, four transgender women were convicted for the offence of being “a man” appearing in female attire in a “public place” for an “improper purpose.” This offence falls under the 1893 Summary Jurisdiction (Offences) Act section 153(1)(xlvii) and, in its application, disproportionately targets trans women. Labeling the law “hopelessly vague,” and constitutionally invalid, the litigants argued that the offence infringes on their rights to due process, freedom of expression and non-discrimination and equality. The litigants further argued that the law is not formulated with enough precision and clarity to allow the ordinary person to regulate their conduct. It is important to note that “man” under this summary offence has been treated by state officials as including persons whose birth certificates describe them as “male” at birth and who identify as transgender persons or trans women. However, there is growing acceptance and respectful treatment by judicial officers, and others, of persons whose gender identity does not accord with the gender marker on their birth certificate. It is a common and respectful practice to refer to a transgender person in a manner that is consistent with the gender that matches the individual’s identity, which in this case is female. 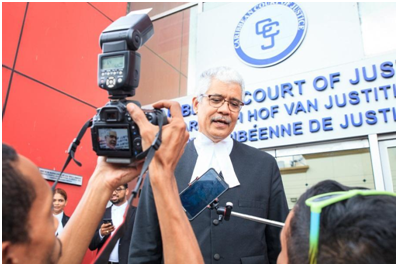 The four litigants who were all present at the CCJ hearing on June 28, were represented by attorneys-at-law Douglas Mendes, S.C. (Trinidad and Tobago), lead counsel, C.A. Nigel Hughes (Guyana), MishkaPuran (Guyana), Clay Hackett (Trinidad and Tobago) and Isat Buchanan (Jamaica). Solicitor General Kim Kyte-Thomas, Kamal Ramkarran and Selwyn Peiters represented the State. 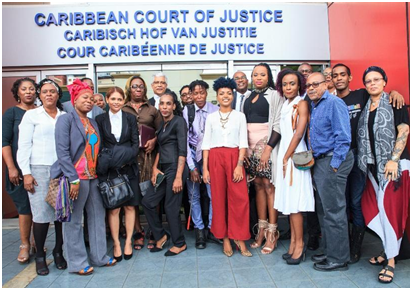 In addition to the four litigants, over twenty representatives from civil society organisations and universities were present to observe the proceedings. Civil society organizations (CSOs) present included the Society Against Sexual Orientation Discrimination (SASOD), one of the original litigants in this case, Guyana Trans United (GTU), Guyana Rainbow Foundation (GuyBow), Promoting Empowerment Through Awareness For Les/Bi Women (PETAL) from Belize and the Alliance for Justice and Diversity (ADJ), which is a coalition of seven organisations in Trinidad and Tobago. The Faculty of Law The UWI Rights Advocacy Project (U-RAP) was also present. One of the major hurdles for the appellants in their challenge to the 125-year-old law was the existence of a savings law clause in the Constitution that made it harder to use the Guyana Constitution to question laws in force before the 1980 Constitution. However, the ground-breaking decision of the CCJ on Wednesday June 27, in the case of Nervais and Severin v AG of Barbados, provides an interpretation of savings law clauses that significantly limits their negative impact in cases challenging colonial laws.The CCJ declared that the mandatory death penalty in Barbados was unconstitutional and that the general savings law clause was not a barrier to that declaration. 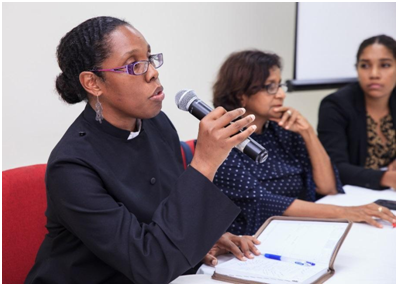 At AJD’s public forum of June 28, panelist and Managing Director of the Lloyd Best Institute of the West Indies, Sunity Maharaj, said that, “To one degree or another, people of the Caribbean have been living lives of improper purpose,” making reference to histories of resistance and struggle in response to colonial oppression. Much of the discussion earlier that day between the CCJ judges and the attorneys focused on whether the term “improper purpose” was sufficiently certain to allow persons to know what was being prohibited. In his comments and questions, Justice Wit emphasized that the test must be based not on legal experts as the standard, but ordinary citizens and charges should stem from crimes and not one’s manner of dress. Mendes SC strenuously argued that those applying the law specifically targeted the appellants as trans women. The State suggested that any arbitrary and discriminatory enforcement of this law could be addressed through appeals and applications for judicial review. During the hearing, President Saunders commented that transgender persons who are not of great means or social influence may lack meaningful access to these procedures and thereby be at risk if the law is not sufficiently certain. Justice Wit gave the example of a rich person and a poor person, both of whom in principle could reserve a room at the fancy Waldorf Astoria Hotel, but, of course in real terms, this hotel was entirely out-of-reach to the poor person because of lack of means. It is important to recognize the experiences and efforts of the four transgender women leading this litigation over the past eight years. Being a part of an extremely marginalized community, they have faced significant barriers to legal representation and accessing justice due to various contributing factors such as poverty and discrimination. While they were successful in accessing partnerships and resources to help further their challenge of the law, the larger community of trans persons still face many of these barriers. This litigation is an important step towards a more progressive and accepting society but we should remain cognizant of the everyday realities of those who are still marginalised due to their identities. The CCJ has reserved judgment in this appeal. If the CCJ finds for the appellants, it can declare that the summary offence in section 153(1)(xlii) is inconsistent with the Constitution and therefore null and void. Alternatively, the CCJ may seek to modify the offence to bring it in conformity with the Guyana Constitution. The written decision in the McEwan appeal could be delivered during the remainder of 2018 or the first half of 2019, based on CCJ’s practice in other cases.